Sheep numbers are continuing to decline nationally although the South Island numbers have increased, mainly as numbers for the Canterbury-Marlborough region recover after the droughts of 2015-16. Based upon their annual survey Beef and Lamb have published the results of last season’s survey. Overall lamb numbers, which are the engine room of the sheep industry, at 23.8 mln are (only) down by -0.7% or 163,000 this is due to a record national lambing which at 129% is well up on the 10 year average of 121.4%. 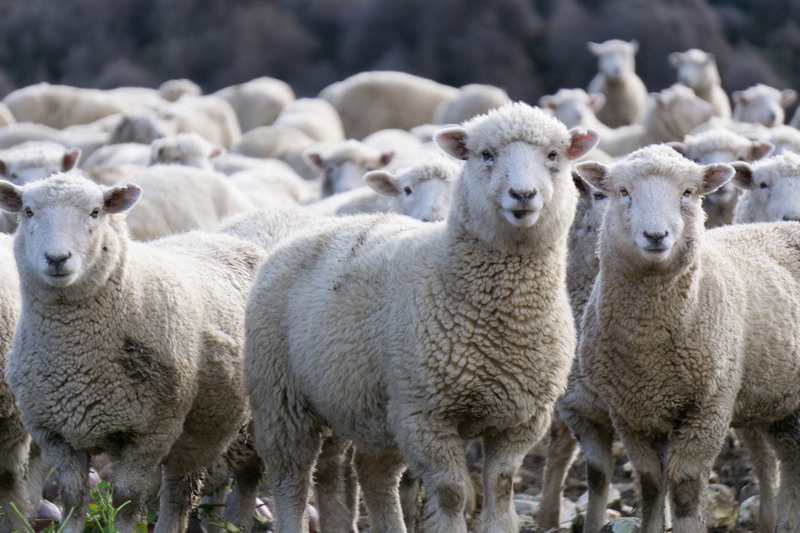 Each 1% equates to 174,000 lambs so the increasing production farmers are managing to obtain is mitigating the impact upon the processing industry. Total ewe numbers are down -2.1% to 17.5 mln. The lift in production is all the more commendable given that the best land has be siphoned off to (arguably) more productive land use such as dairying and cattle finishing. While beef cattle numbers have also been declining over the last 30 or so years, dropping from 4.6 mln in 1990 down to 3.5 mln by the 2015-16 season, latterly they have begun to increase lifting in the last two years to approx. 3.68 mln. This lift also apparently is impacting upon sheep numbers as the aging farming population find working cattle less physically demanding than sheep, hastening sheep demise. Lamb prices to farmers for the last and current season have shown a considerable lift based upon increasing international demand for lamb meat and the kinder seasons for farmers helping to keep the processing companies sharpening their collective pencils. In the short term the decline in numbers has perhaps not been felt too harshly by the processing companies as the higher lambing percentage has help disguise it but also the increasing kill from reducing numbers has also meant in the short-term numbers through the processors have held well. For the 2017-18 season 24.1 mln sheep were processed for export compared to 23 mln the previous year. From a sheep perspective, the concerning numbers surround the adult sheep with the ewe kill up to 4 mln from 3.6 mln the previous year and hoggets’, 242,000 up from 230,000 the previous year. One of the reasons that sheep farming has been so successful over the previous 100 years (mostly) has been due to the comprehensive infrastructure that has built up around it, these include; processing plants, trucking companies, saleyards and stock and station agencies. As numbers decline the infrastructure and the accompanying competitive advantage that it brings will be reduced and while prices may remain at current levels costs are likely to increase and erode profitability. Over time a buffering affect to meat prices has been the wool clip however, as time has gone by, wool, with the exception of merino and mid-micron wools which make up a relatively small percentage of the total wool clip, has reduced profitability to the point where it is becoming close to a cost to the farming system. So, the dual purpose animal which was the backbone of the sheep industry in reality exists no more. The glimmer of hope for sheep number could come in the form of sheep dairying. There are a number of system options farmers can adopt depending upon their land resources and preferences. But an outcome of a vibrant sheep dairy industry could be an equally vibrant meat industry with both piggy backing on each other and making another true duel purpose animal. With the use of terminal sires there is no reason why the resulting sheep dairy lamb crop can not be an asset to the meat industry. To date interest in establishing international processing capacity has been shown by the dairy industry, however the meat companies are also know getting interested in the potential sheep dairying can offer. Both industries are needing to expand their bases with peak cow having arrived, or close it, and sheep numbers reducing. Who knows, maybe a good case could be made to Uncle Shane and the Provincial Development Fund for some exploratory funding. With the announcement today of the new low emissions support fund perhaps and argument could be made on that basis. Just off the press Dr Warren Parker has been appointed as Director and Chair of Landcorp, the Minister of Finance Grant Robertson and Associate Minister of State-Owned Enterprises Shane Jones announced today. Dr Parker is a former Chief Executive of Scion (the NZ Forest Research Institute) and Landcare Research and was previously Chief Operating Officer of AgResearch. He currently holds a number of board roles including on Predator Free 2050 Ltd, Farmlands Cooperative Society, Genomics Aotearoa and is the Chair of the Forestry Ministerial Advisory Group. Until recently he was Chair of the New Zealand Conservation Authority. “Dr Parker is one of the most experienced experts in New Zealand’s primary industries, operating at the most senior levels across sectors as a scientist, teacher, manager and, most recently, in governance roles. We are lucky to have someone of Dr Parker’s experience and ability to take over the Chair’s role at Landcorp, the nation’s largest farming enterprise,” said Mr Robertson. “Effective stewardship of Landcorp is vitally important. This company plays a significant role in New Zealand agriculture and our regions. Dr Parker’s experience across a wide range of primary industries will give him the ability to look across all the work of Landcorp and ensure that the shareholder is receiving value for money from our investment,” said Shane Jones. Schedules for sheep, beef and venison have all continued their slide with the store markets being held up by the grass market provided by the continuing rain. Prices for sheep are still considerably ahead of this time last year which was being affected by the prolonged dry spell however cattle are now well behind and venison about par. Lamb breeders look to be supporting the saleyards with good numbers of lambs coming through and likely exceeding published works prices and trying to beat the inevitable falls that must come through soon. Good condition store ewes are selling well with tops exceeding the $200 mark. While nothing too exciting, at least last week’s Christchurch wool sale had a small lift over most classes of wool which is a reversal of the recent trend. Quite a few reared calves are coming onto the market now with a wide range of prices being recorded. 179kg Friesian bull calves went for $2.91 a kg while 103kg Hereford x Friesian heifer calves made $5.53. Given the amount of feed around at the moment in some regions, farmers are likely having to weigh-up between keeping some sort of control over pastures while watching the schedule steadily falling. The old rule of thumb was; you didn’t lose on 10c per week drops if your cattle were putting on 1kg LW per day. Given the feed most should be doing that. As with all other meat types, venison experienced a 10 cent drop from processors.